We're squarely in the middle of Lent now. Three and 1/2 weeks in, three weeks and three days until Easter. I encourage you to keep on keepin' on! While meditating on the Stations of the Cross (especially St. Peter Julian Eymard's Eucharistic Stations) is a favorite, as is this meditation on the Passion of Christ by St. Thomas More, I'm really really soaking up the goodness of In Conversation with God . There are three little meditations each day, which are great for morning, noon and evening prayers, and they are so fruitful. Which are your favorite readings and meditations during Lent? I love the Anime Christi prayer, St. Augustine's prayer to the Holy Spirit and the Song of Solomon. 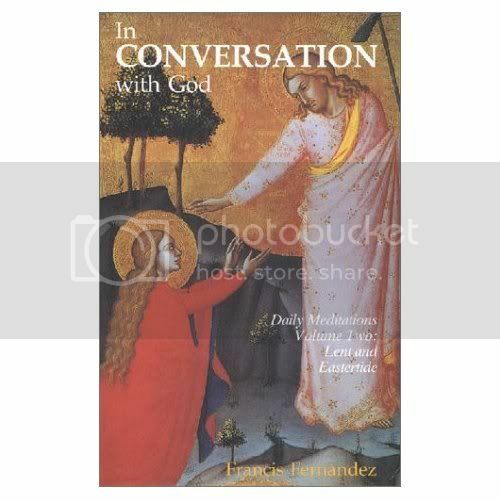 In Conversation with God is my year-round reading. I have taken to reading only one of the three parts each day (fits well with the Church's three year cycle) on the advice of my confessor, as he says I am better off reading less and meditating on it more. I also love Anna Catherine Emmerich's The Dolorous Passion of Our Lord Jesus Christ and St. Francis de Sales sermons for Lent. Oh goodness, I would love a subscription to the Magnificat! I've had one off and on since they started but I'm currently on the "not subscribed" downswing :). Oh, the Anime Christi is one of my favorites! Unfortunately I never memorized it, and the parish I'm in now doesn't have missalettes so it's not printed on the back. I should look it up now :). Oh that's good advice :-D. Now I need to look up St. Francis de Sales' sermons... are they in a compilation or a stand-alone book?